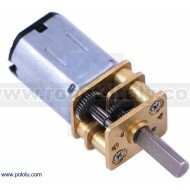 This gearmotor is a miniature high-power brushed DC motor with a 51.45:1 metal gearbox. It has a cross section of 10 × 12 mm, and the D-shaped gearbox output shaft is 9 mm long and 3 mm in diameter. This version also has a 4.5 × 1 mm extended motor shaft. Key specs at 6 V: 625 RPM and 120 mA with no load, 15 oz-in (1.1 kg-cm) and 1.6 A at stall. These tiny brushed DC gearmotors are intended for use at 6 V, though in general, these kinds of motors can run at voltages above and below this nominal voltage, so they should comfortably operate in the 3 – 9 V range (rotation can start at voltages as low as 0.5 V). Lower voltages might not be practical, and higher voltages could start negatively affecting the life of the motor. The micro metal gearmotors are available in a wide range of gear ratios—from 5:1 up to 1000:1—and with four different motors: high-power with long-life carbon brushes (HPCB), high-power with shorter-life precious metal brushes (HP), medium-power (MP), and low-power. The HPCB version (shown on the left in the picture below) can be differentiated from versions with precious metal brushes (shown on the right) by its copper-colored terminals and slightly less shiny case. Note that the HPCB terminals are 0.5 mm wider than those on the other micro metal gearmotor versions (2 mm vs. 1.5 mm), and they are about 1 mm closer together (6 mm vs. 7 mm). 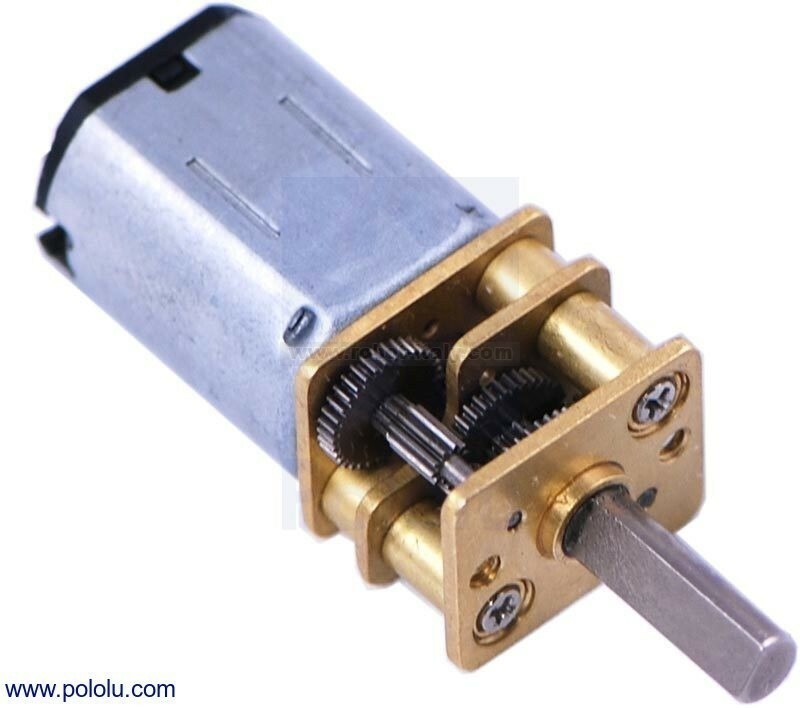 The gearbox has a long (0.365" or 9.27 mm), 3 mm-diameter D-shaped metal output shaft, and the brass faceplate has two mounting holes threaded for M1.6 screws (1.6 mm diameter, 0.35 mm thread pitch). 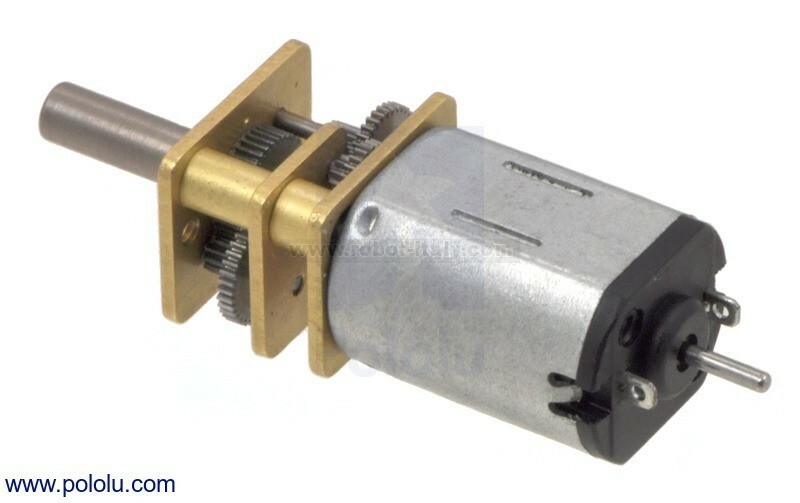 The gearmotor weighs approximately 0.35 oz (10 g). Versions with the extended motor shaft have a 1 mm-diameter round shaft that protrudes 4.5 mm from the rear of the motor, between the two motor terminals; this is not pictured in the above dimension diagram. In terms of size, these gearmotors are very similar to Sanyo’s popular 12 mm NA4S DC gearmotors, and gearmotors with this form factor are occasionally referred to as N20 motors.